Groundforce Shorco has supplied cost effective, time saving propping solutions to Barrhead-based civil engineering specialist George Leslie for the King’s Inch CSO project. This is one of the last in a series of CSO (combined sewer overflow) installations carried out for Scottish Water as part of a £250 million, five-year programme or work to upgrade the waste water network in the Greater Glasgow area. The King’s Inch project, near Renfrew, involved the installation of a large (9m x 5m) concrete CSO chamber, four DN2400 (2.4m diameter) manholes and approximately 40m of associated DN1400 (1.4m diameter) ductile iron pipework. The site was in an area of Renfrewshire notorious for poor ground conditions and the bulk of the excavation was in very soft silts and loose sands with the water table approximately 1m below ground level. These poor ground conditions meant that any potential disturbance could cause structural damage to nearby residential properties and a main road. 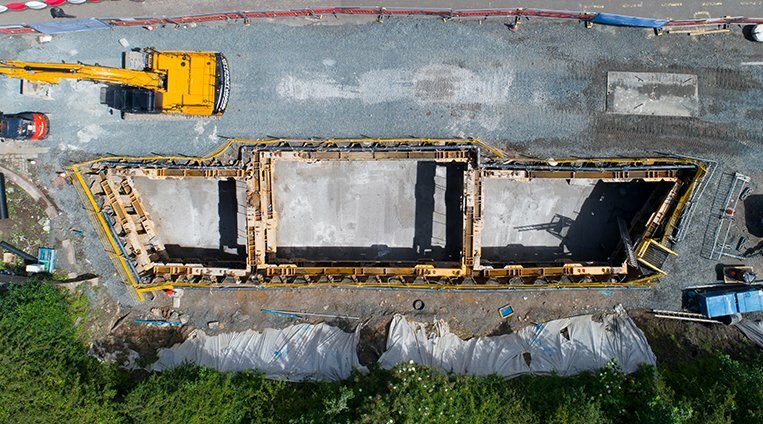 So weak was the surrounding ground that George Leslie specified sealed13m-long GU23n steel sheet piles to line the excavation, driving them up to 9m below formation level to minimise upward water pressure in to the formation. Another challenge was the timescale. Flooding was a problem in the locality and it was intended to complete all work as soon as possible to prevent further flooding in the area and have the road fully opened to reduce congestion in the town centre. In particular, it was essential that this was done before Christmas to allow shoppers to commute to the nearby Braehead shopping centre as this was the main route from Renfrew. The solution proposed by Groundforce was to install a large (35m long) cofferdam that would encapsulate not only the CSO chamber, but also the DN1400 pipework and two of the four manholes. By drastically reducing the total number of excavations, this solution reduced mobilisation costs for the piling team as well as the movement of plant on and off the site. It also reduced the programme length because the majority of the ‘off-line’ works could all be carried out within one cofferdam, rather than in five separate excavations. The two manholes were incorporated into the main cofferdam design with a prop cantilever support and a single level of framing to accommodate the existing sewer into which the two manholes were tied. The main cofferdam was supported by two levels of modular hydraulic frames. The sheet piles were installed using a non-vibratory hydraulic still worker, eliminating the risks associated with traditional piling equipment. The CSO chamber and the concrete manholes were installed on CHD concrete piles ranging from 300mm to 600mm in diameter, installed below reinforced concrete bases. Each manhole is supported on four piles while the CSO chamber sits on eight piles. In order to cope with the water pressures resulting from the high water table, well-points were installed to de-water the excavation constantly throughout the works. The DN1200 spill pipe was designed as a traditional two-stage construction with a concrete blinding slab cast to allow the lower hydraulic frame to be removed to allow for the large diameter pipe to be installed using lighter GFI trench sheets. The main cofferdam was supported with two levels of Groundforce Shorco Mega Brace frame using the natural articulation of the brace to achieve the appropriate angle of the piling footprint. The client’s own GU23n sheet piles were sacrificed and incorporated into the permanent works, thereby eliminating any risk of movement during extraction. GFI trench sheets and MS D/A Brace were also supplied, plus a 7RF piling hammer from Piletec was used to install the GFI piles at the spill pipe section. This minimised the amount of vibration generated during the installation of the piles. “It also made the installations easier. The pipelines enter the manholes at different angles and with them all in the same cofferdam it was easy to line them up accurately,” says Andy. “We have worked with Groundforce on several previous projects, including other Shieldhall UIDs for Scottish Water,” he adds. “We have a good working relationship with them; they know exactly what we need and their technical support is excellent. Groundforce is currently working on other Scottish Water projects with George Leslie.